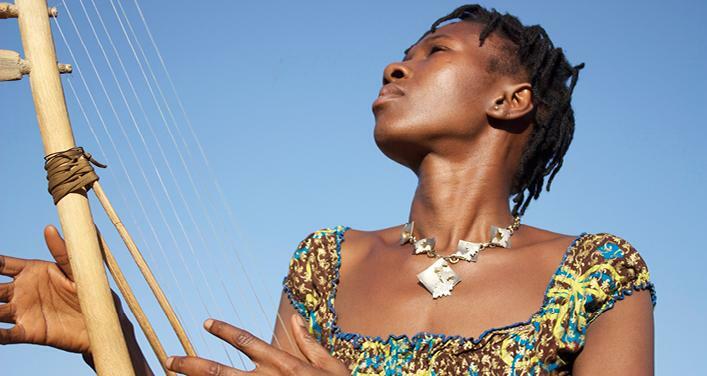 Born in Kankan, Guinea, Doussou Koulibaly (singer, songwriter, composer, performer) is pursuing her mother’s dream—a passion for song and dance, which she learned at a very young age. If the songs of Bembeya Jazz and Sory Kandia Kouyaté make up the soundtrack of her youth, it’s the influences of the great Malian musicians—Oumou Sangaré, Rokia Traoré, and Salif Keïta—who persuaded her to move to Bamako in 2004, where her paternal ancestors reigned the Bambara Kingdom of Ségou. She first learned the guitar, but was quickly swayed by the hypnotic sounds of the kamélé n’goni, a pentatonic harp-lute instrument similar to the donso n’goni, the mythic instrument of the hunters. She thus became the first Guinean singer to play this instrument, giving her the inspiration and harmonies for her first compositions. In 2009, she recorded her first album in Bamako. After numerous concerts, she decided to move to Quebec in 2010, and got the chance to perform in the Spectacle Bénéfice de Jeunes Musiciens du Monde, part of the Rythmes au Féminin evenings presented by Club Balattou. Doussou plays Mandinka Afro-Pop songs, sung in Mandinka, and offers an adaptation of a traditional theme. Her lyrics, both tender and critical, portray the hopes and fears of a young African woman torn between her pride in her heritage, and the desire to liberate herself from the customs of her people, which hinder women’s emancipation.